Adult crickets are a great deal bigger than grasshoppers. The antennae are thin and longer than the cricket itself. The body is stocky, legs long but somehow seem clumsy because the heavy body doesn’t allow long jumps. The female cricket is easy to distinguish by its long and sturdy ovipositor, tapered at the end, at the rear of the abdomen (see lower photo). The singer in the bush is quite hard to find. 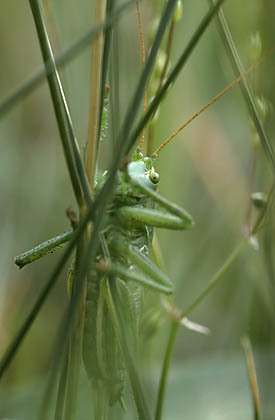 The green colour and the wings, similar to leaves, make the cricket nearly invisible. The singing cricket can often be heard from quite high up, even the top of a ten metres high tree can suit them. This sharp, loud “end of summer song“ we can hear into late night. Grasshoppers are mainly animal eaters, they hunt for smaller insects, invertebrates and sometimes smaller specimens of the own tribe. 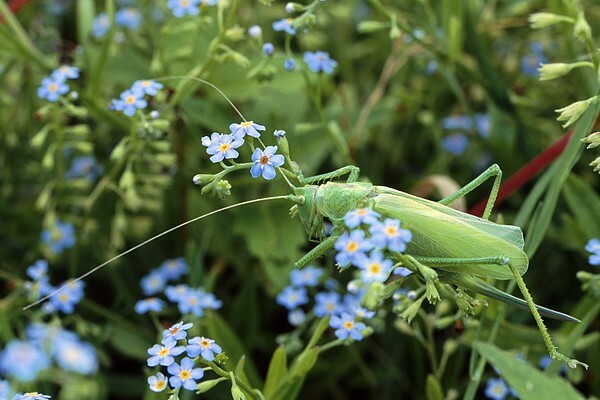 There are nine species of crickets in Estonia.